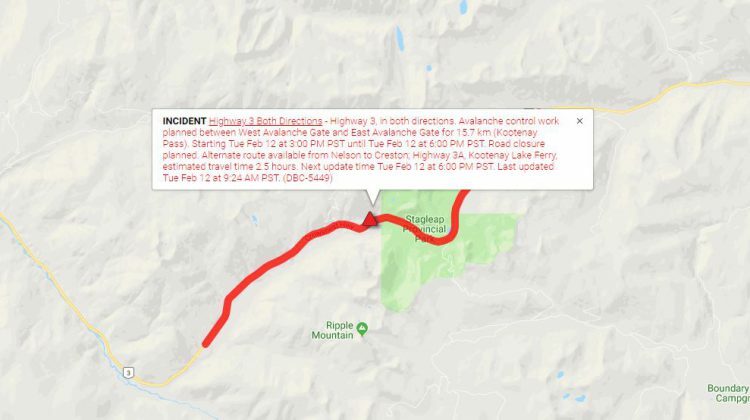 Closed: Highway 3, in both directions. Avalanche control work planned between West Avalanche Gate and East Avalanche Gate for 15.7 km (Kootenay Pass). Starting Tue Feb 12 at 3:00 PM PST until Tue Feb 12 at 6:00 PM PST. Alternate route available from Nelson to Creston; Highway 3A, Kootenay Lake Ferry, estimated travel time 2.5 hours. Next update time Tue Feb 12 at 6:00 PM PST. Last updated Tue Feb 12 at 9:24 AM PST.